Tuesday, October 31st is Halloween at DES! First, we will enjoy the school-wide Parade around the school starting at 10:00 am. Parents & younger siblings are welcome to gather outside the school and watch as the students will all walk around the building twice. Next up are the Class Parties, always a big hit! We have a schedule and we ask you to remember that for the later parties, you will need to have your car out of the bus loop parking lot in time for the buses to arrive. Have you been doing your reading? Remember to turn in completed October Book It calendars this week! In case you misplaced your copy, the October calendar is attached. The November Book It calendar is also attached for you to print at home and have your child log his or her reading in November. Children that participate in the Book It program every month will be invited to a Kona Ice party at the end of the year! We told you to start looking for baby pictures. The yearbook committee is now collecting those from 5th grade families, along with a current photo of your choice, as well as sentiments – all for the yearbook this year. Submissions will be made online and are due by November 30th. See the flier for all the details on how to do it and where to go. PLEASE try and get these in by the deadline. This special section of the book takes some time to prepare. Any questions, e-mail desgatorsyearbook@gmail.com. Thank you. Have you ordered yours yet? Remember to order your DES Yearbook for this school year. The sooner you order, the more it helps it all come together. The cost is $18 for a non-personalized book. There are extra items available. Go ahead and get it done today! Ordering is online at: http://www.yearbookforever.com. All of the directions are included on the flier. For any questions, contact Steph Brooks at: tobgr8ful@gmail.com. The Superintendent’s Parent Involvement Advisory Council (PIAC) for Anne Arundel County Public Schools is an organization designed to represent the families in this cluster. The Council’s task is to advise the Superintendent on parent involvement issues ranging from policy to implementation. One of the PIAC representatives for our cluster is Davidsonville Elementary School parent Jerry Esper. If you have any issues that concern parent involvement in the schools, you can contact Mr. Esper at PIACSouthRiver@gmail.com or any DES PTO Board member who can forward information for you to the PIAC. Thank you. Note: Due to a change with the e-mail distribution provider, the Gator Blast could look a little different next week. We’re not sure if you’ll notice much change (we hope not), but just wanted to let you all know. Come out Friday for an Evening of Family Fun! Come join the fun this Friday! Current and past Davidsonville Elementary School families are invited to attend a special 15th anniversary celebration on the fields at DES this Friday evening, beginning at 6 pm. Enjoy snacks and hot chocolate while we all snuggle in to watch “Harry Potter and the Chamber of Secrets” on the field. Both the current DES building and the film we will see came to life in 2002. So, let’s have a party! Everyone is encouraged to come dressed as your favorite Harry Potter character. Movie starts at 6:30. Bring your friends and family for a free, fun night out, and bring along blankets or chairs for yourselves. Muggles are welcome too. It is the very last two days of our spectacular food drive at DES. Thursday’s theme is Campfire items- beans, chocolate, graham crackers, marshmallows, and more. Friday is wide open for any and all food items you can donate. Families have been so very generous again this year and every donation helps those in need. Together we can make amazing things happen! Fall Gator Gear is here! Thank you for showing your school spirit and purchasing Gator Gear this fall. Most of the items were delivered on Monday. There are 20 orders that are still being processed and will deliver next week. If you do not receive your order by next week, or if there are any issues with your order, please email jody@jodychristian.com. Are you a PTO Member this year? Did you forget to send in your PTO Membership form and payment, but meant to? We are offering a very last-minute, 2 day chance to join so that you don’t miss out. If you didn’t join the PTO you will not receive a copy of the Student Directory, and while your student will be listed, there will not be any contact information provided for your family. Fill out the form and send it along with payment into the office by this Friday (attn: PTO Membership) and we can add your info. to the Directory before we send it out next week. If you’re not sure if you joined, here’s your chance. Questions? E-mail Membership Chair Christina Feindt at: cfeindt@gmail.com. Thank you to the hundreds of families that have joined this year! And thanks also to all of the DES teachers and staff who have joined as well. Look for information in the upcoming Sunday Blast for submitting baby photos and sentiments for a special section of this year’s DES Yearbook. Start tracking down your favorite photo! Box Tops for Education this week! Thanks to all who have donated for your generosity and support! Monetary donations are still being accepted and every dollar helps! All check donations are 100% tax deductible and should be made to Anne Arundel County Food Bank. Thank you. You are all cordially invited to an extra special Outdoor Movie Night at DES on Friday, October 27th at 6 pm. Tonight we recognize the 15 year anniversary of the school building that we all know and love. So, we will go back in time by watching “Harry Potter and the Chamber of Secrets” on the field at DES. Movie starts at 6:30, light snacks and hot chocolate provided. All students and their families are invited to attend and the whole event is free. Dress up as your favorite Harry Potter character! It will be a fun night for all! Contact Cory Samaras Griffeth at: csamaras@hotmail.com if interested in volunteering. Did you know there is a nationwide event that offers us all an opportunity to say “thank you” to Principals everywhere? As we honor their hard work and dedication, we encourage the entire DES family to recognize and show appreciation for the support our Principals provide to schools, staff, students, parents, and community. Tuesday, October 31st is Halloween at DES! First, we will enjoy the school-wide Parade around the school starting at 10:00 am. Parents & younger siblings are welcome to gather outside the school and watch as the students will all walk around the buidling twice. Next up are the Class Parties, always a big hit! We have a schedule and we ask you to remember that for the later parties, you will need to have your car out of the bus loop parking lot in time for the buses to arrive. Coming home with each student on Wednesday will be a bright red brochure with information about how to access the school’s databases and e-books from home. Questions? Contact Mrs. Frank in the library at cmfrank@aacps.org Enjoy! Order Your Yearbook – It’s online and it’s easy! Go ahead and get this task off your to-do list. Order your DES Yearbook for 2017/2018 now! Ordering is online at: http://www.yearbookforever.com. All of the directions are included on the latest flier, which you can find online here. For any questions, contact Steph Brooks at: tobgr8ful@gmail.com. Nicole was named DES Volunteer of the Month for August. Nicole does a fabulous job leading the Garden Committee. If you have noticed any festive décor outside or beautiful landscaping around the school, she would be the mastermind. 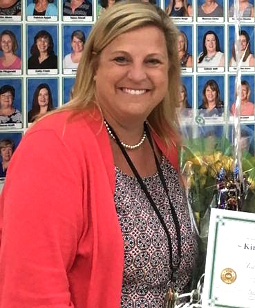 She has served as Secretary of the PTO Board, and has also been the committee chair for the Teacher Luncheon & Hospitality Committee to rave reviews from a grateful staff! Nicole and her husband Jeff have 5 children, three currently attending DES. She is an avid tennis player, involved with Girl Scouts and various other community groups, and is an all-around wonderful person. Nicole, we appreciate your helpful spirit, friendly nature, and warm smile! There is interest in forming a new Daisy troop for Kindergarten age girls this year. If you would like to find out more information, or sign up your student, send an email to: su47placements@gmail.com. Thank you. DES Teacher of the Year!!! Here is this week’s plan for donated items for the ongoing Food Drive and any dress up days scheduled. Orders are due on Monday for the Catalog Fundraiser that came home a couple of weeks ago. Housewares, holiday goods, sweets, wrapping paper, magazines and more are available to order. And out-of-town family and friends can order online at www.shopbelieve.com. Please send in your order envelope with payments (checks made out to DES PTO/no taxes added) with your students. And thank you for supporting the DES PTO. Whole Kids Yoga is once again offering their special fun yoga for young people with two different fall sessions. K-2 will be held on Wednesdays after school, running from Nov.1-Dec. 13th. Grades 3-5 will meet on Tuesdays before school, from Oct. 24 thru Nov. 28. Both sessions feature 6 classes for $99. Fill out the registration form and waiver attached here and return by the requested dates on the fliers–but hurry, classes start soon! Time to send in your Box Tops! Thanks to everyone in advance for your full cooperation. If you have any questions, please contact chairperson Jinna Suggs at: jinnap@yahoo.com. Order your student’s yearbook online now. Your early order helps make everything easier, so do it today while you’re thinking about it. The cost is $18 and there are extra items available. Ordering is online at: http://www.yearbookforever.com. All of the directions are included on the latest flier. For any questions, contact Steph Brooks at: tobgr8ful@gmail.com. DES Teacher of the Year! We are very excited to announce that Mrs. Kimberly Akers has been selected as this year’s Teacher of the Year at Davidsonville Elementary School. Mrs. Akers, a Kindergarten teacher, was recognized on Friday at the school. The praise heaped on her by parents, students, staff, and alumni attests to her popularity with nearly everyone who knows her. The word “amazing” is used often by those around her, and in the letters of those who nominated her. We are thankful to have a teacher who gives so very much. Congratulations to Mrs. Akers!! Many thanks to all who submitted Teacher of the Year nominations! We have passed along to all nominees the warm and thoughtful feedback that was submitted. DES is clearly fortunate to have such terrific teachers. You will have a chance in the spring to submit nominations for next year’s Teacher of the Year. Need something for kids to do Thursday/Friday? A kid crafting drop-off class for ages 7-15 is being hosted by a DES parent at The Pottery in Edgewater. Held on both Thurs & Fri, the sessions will be from 10 am to 1 pm and the $40 cost will cover the craft and a pizza lunch. The group will play a couple of simple, age appropriate games and have small prizes for all participants. Registration is required. If you’d like to find out more, visit https://www.facebook.com/events/1482149288500061/?ti=icl. Please note that this event is not sponsored by DES or the DES PTO in any way. *Note: Friday twin day is also picture day at DES. The AACPS Transportation Department has worked to relieve overcrowding on our busses. Attached you will find the specific memos that will go to the students on Busses 82, 115, 330, 217, and 27. Paper memos will be sent home with students on Monday. All changes will go into effect on Thursday, October 12, 2017. Better get your haircuts now! It’s time for the Fall Student Picture Day at DES on Friday, Oct. 13th. You will be receiving an order envelope sent home this week. Make sure your student brings the order with payment on picture day. “15 Magical Years at Davidsonville Elementary School” a Celebration & Movie Night featuring Harry Potter and the Chamber of Secrets (released in 2002 – when the new DES building opened)! Light snacks and hot chocolate provided. All grades and their families invited to attend. More details coming. Volunteers/Harry Potter fans always needed! Contact Cory Samaras Griffeth at: csamaras@hotmail.com if interested in volunteering. The 2017 Martial Arts Enrichment program starts this Tuesday, Oct. 10th. We will offer 6 introductory classes at DES for students in grades K-2, after school for only $40. All profits will be donated to the DES PTO. Kids will learn the basics of martial arts and self defense and get to test for their white belt at the end of the program on, followed by a party at ECMA Edgewater. Classes will run in the school gym from 4:00pm to 4:45pm on Oct. 10, 12, 17, 24, 26 and 27. Belt test and donut party will be at ECMA Edgewater on Oct. 28 at 9:00 am. This is a great way to start your children in a martial arts program without a long term commitment! Kids with experience are also welcome! Contact Program Chair, Mike Schneider with any questions, 410-693-8967, chayaandmiri@gmail.com. You are invited to now order your DES Yearbook for this school year. It may seem early, but things are already happening for this unique memory book. The sooner you order, the more it helps it all come together. The updated cost is $18 for a non-personalized book. There are extra items available. Ordering is online at: http://www.yearbookforever.com. All of the directions are included on the flier. For any questions, contact Steph Brooks at: tobgr8ful@gmail.com. The Citizens Advisory Committee (CAC) is a structured group appointed by the Board of Education to provide advice to the Board on specific issues impacting educational policy, activities, and programs. The CAC may choose to study and report on educational issues of countywide concern. They also respond to requests from the Board for research and recommendations on specific educational issues. The CAC representative for our school is Kelly Purnell: kellypurnell4@gmail.com. If you ever have issues that you would like addressed or questions you would like answered, you can contact our CAC representative. and Yearbook. In the past, she has helped with the flu clinic and as Media helper, and behind the scenes for the school play. You will also see Sandy volunteering in the classrooms. Sandy and her husband Mark have a son Ethan (7th grade-CMS), and 2 daughters at DES- Addisyn in 5th and Ella in 3rd. Thanks Sandy for sharing your time and talents with us! If you missed last week’s general info. session at AHS, you have another chance. There will be another general session held on Saturday, Oct. 14th, from 9-11 am., at North County High School, 10 E 1st. Ave, Glen Burnie, 21061. There will be an IB Middle School information session held on Tuesday, Oct. 17th at Annapolis Middle School at 6:30 pm. There will be a STEM Middle School Information session held on Thursday, Nov. 2 at 6:30 pm at Central Middle School. For more details on the AACPS magnet programs, visit: www.aacps.org/magnet. lots going on at DES! The “Kids Helping Kids” Food Drive starts this week! It’s the time to give. The annual Food Drive is back, so help us Fill the Fridge for the next 4 weeks. We have a game plan in place and ask for certain items on certain days to help us pack things up nicely. But, feel free to give anything, anytime during the drive. You should have received the flier sent home last week. Lots of fun activities and color days are involved too, so read the flier to plan your week! And don’t forget to give! Bring the whole family and enjoy a mega fun night at Skate Zone in Crofton on Friday, Oct. 6th. It’s Mix & Match night, so wear your craziest outfit to win a prize at the door. Hours are 5-7 pm, $5 admission, $4.50 skate rentals (skates & scooters only). Skate Zone is located at 1082 Rt. 3 South, Crofton 21114. See the flier for more info. We hope to see you all there! The Green School Club is back and ready to get going with all kinds of interesting club meetings, projects, and more. Explore and learn about the natural environment and what we can do to help. Club meetings will be on the 2nd Monday of the month before school this year, at 8:15 am. The first meeting is Monday, Oct. 9th. Fill out the registration form and submit by this Friday, Oct. 6. For info, contact Chairperson Sheila Norman at sheilamnorman@yahoo.com. The club that makes math FUN! The 24 Game Club is a program that introduces all kinds of math solving skills and techniques, and kids love playing it. There will be a 24 Game competition in April and the club will start meeting in October on Mondays after school through all of Nov., then switching to Wednesdays after that. Membership is open to 3rd thru 5th graders. See the flier and registration form for more details. Contact faculty chair, Mrs. Yancey at: kyancey@aacps.org for info. DES and East Coast Martial Arts (ECMA) are teaming up again for the 2017 Martial Arts Enrichment program! ECMA will offer 6 introductory classes at DES for students in grades K – 2, after school in October (grades 3 – 5 to follow in January) or only $40. All profits will be donated to the DES PTO. Kids will learn the basics of martial arts and self defense and get to test for their white belt at the end, followed by a party at ECMA Edgewater. Classes will be in the DES gym 4 to 4:45 pm on Tuesdays, Oct. 10, 12, 17, 19, 24 and 26. Belt test and donut party will be at ECMA Edgewater on Oct. 28 at 9:00 am. This is a great way to start your children in a martial arts program without a long term commitment! Kids with experience are also welcome! See the flier for all the details. Send in your registration forms and payment in an envelope marked “Martial Arts Program.” Contact Program Chair, Mike Schneider at 410-693-8967, chayaandmiri@gmail.com. You are invited to now order your DES Yearbook for this school year. It may seem early, but things are already happening for this unique memory book. The sooner you order, the more it helps it all come together. The cost is $19 for a non-personalized book. There are extra items available. Ordering is online at: http://www.yearbookforever.com. All of the directions are included on the flier. For any questions, contact Steph Brooks at: tobgr8ful@gmail.com. A DES parent has helped to organize a collection of goods to help Puerto Rico Hurricane survivors. Suggested items are listed on the attached flier and you can drop off these goods at Davidsonville Park this week on Monday and Tuesday evening from 5-8 pm. If you have any questions, contact Jenn Keefer at 617-875-8941. Announcing the October events for youth available at the Edgewater Community Library. See the attached flier for all the information. A DES parent has two used violins for sale. They would be a great option for those new strings players at the school this year. See all of the details on the info. sheet.